The cool thing about shortbread is that you can start with one very basic recipe and make little adjustments to create some amazing different flavours and textures. Many Scottish families will have their secret family recipe that they swear by. It is even said that the secret to good shortbread is in the mixing (and that different sets of hands will give you different results.) I think that is pretty awesome. A traditional Scottish shortbread recipe is probably the easiest recipe to remember ever. It is a 1:2:3 ratio of sugar: butter: flour. And that’s it. But like I said earlier, you can make little adjustments to this recipe to suit your own taste. You can add a bit of salt to bring out the flavour, you can alter the texture by using different flours, you can add different flavours such as almond or vanilla extract, or you can go really wild and stray from this 1:2:3 ratio. You will see some recipes use this ratio by weight and others by volume. I’ve also heard of using a 1:1:1 ratio or adding more or less of certain ingredients to suit personal tastes. Then there are the variations in the mixing. Some people cream the butter and sugar first and then add the flour. Others swear that the only way to make shortbread is to mix it with the hands. As you can see, there are a lot of different variations from one simple recipe. One thing that stays the same,though, is the butter. I hate to say it, but shortbread is one of those things that just isn’t the same without butter. I have yet to come across any thing that can mimic the taste of butter close enough to get that traditional shortbread taste. This is because almost all of the flavour from shortbread comes from butter. If you change the butter, the taste of your shortbread changes too. One of my favourite shortbread recipes is my grandmother’s, and she uses almond extract in hers. Oh those are some delicious shortbread cookies. I’ve also come to absolutely love shortbread that calls for cornstarch or icing sugar in the recipe. This give the shortbread a really nice melt in your mouth quality that I’m a sucker for. Some people like to go the opposite route and add rice flour to give it a crunchiness. Again, it all comes down to personal preference. 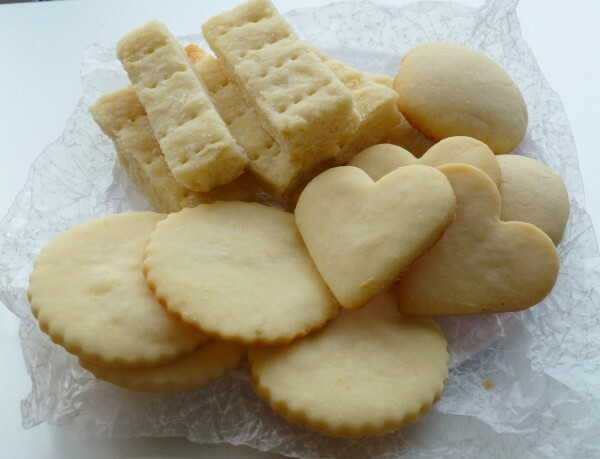 This is one of my favourite shortbread recipes from Joy of Baking. After many many different recipe trials (which, let’s be honest, all tasted pretty good) this one has been the most loved by my taste-testers. Beat the butter until smooth and creamy. Add the sugar and beat until completely smooth. If you are adding in vanilla or almond extract (or some other flavour) now is the time to add it in. Mix together the flour and salt and mix it into the butter mixture until just incorporated. Do not over mix, as this will toughen up the dough. Wrap dough in plastic wrap and chill for at least 1 hour or until firm. If you don’t have a mold, you can also roll out the dough onto parchment paper to desired shortbread thickness. After pricking and scoring wedge or finger shapes, transfer parchment paper with shortbread to freezer for 15-30 minutes. Then transfer to baking sheet, line the edges with tin foil to prevent browning and bake this way. Cut shortbread while still warm with a large, sharp knife. Browned/uneven edges can be trimmed. Take tablespoons of dough and roll into balls and transfer to parchment lined baking sheets. Flatten slightly. Bake for 10-15 min at 300-325 F (150 – 160 C) or until lightly golden. Rotate tray halfway through bake time. Roll dough to ¾ cm thickness onto parchment paper. Cut desired shapes with a floured cutter and transfer to baking sheet. Do not make really large shapes, as they will puff up and look lumpy when baked. Bake 8-10 min at 350 F (175 C) or until lightly golden.